Crag Fell is the fell most closely associated with Ennerdale Water, rising up directly from the southern shore of the lake and is (with Great Borne) one of the two fells that dominates the entrance to the valley from the west. Crag Fell has a similar form to most of the fells around Ennerdale, with a simple southern side and a much more interesting craggy northern side. In this case the northern slopes include Anglers Crag, a nice little climb in its own right (and a great viewpoint for the lake), and a series of unusual lines of crags and slopes which make it look as if the front of the fell is slipping into the lake. Crag Fell can also boast a good lake-shore path, with an interesting scramble around the foot of Anglers Crag that is now fairly straightforward and without any perils. Most people climb Crag Fell from the northern Ennerdale side. There are three routes up from this flank. The most often used begins in the woods west of the lake, and follows a nicely graded path that climbs across the hill, crosses Ben Gill and then follows the unusual grassy ridge that leads to the summit. The second route comes up the slope near Red Beck, then climbs up the eastern flank. The third, and best route, climbs up to the col behind Anglers Crag, then heads directly up the slope behind Anglers Crag, aiming to the left of some scree slopes. These bring you to a groove that runs right to left to the pinnacles, from where a path leads onto the grassy slopes above Revelin Crag. From the south the fell is gentle enough to be climbed at just about any point, using the old mine track that runs from the Cold Fell road to reach the right area. We have one walk on Crag Fell, an ascent along the western ridge and descent down the eastern ridge. The summit is a fairly simple grassy area, with good views up Ennerdale. The line of crags is a little to the north, with a number of gullies leading down to a grassy plateau between two lines of crags (best explored from below). Ben Gill forms the western boundary of the fell, currently (2013) flowing into Ennerdale, but soon to be returned to its original path to drop into the River Ehen instead. Red Beck forms the eastern boundary, again running into Ennerdale. To the south the River Calder forms the southern boundary of the fell. The river is born in the valley between Crag Fell, Whoap and the western end of Ennerdale Fell/ Caw Fell. 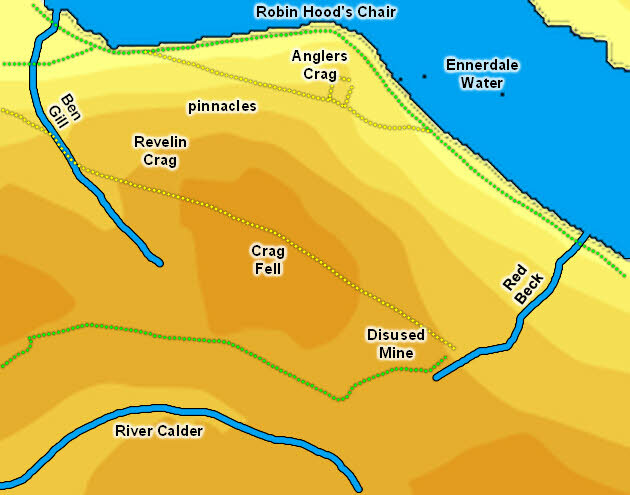 then flows west behind Crag Fell and Grike before turning south to begin its run towards the sea at Sellafield (where it also finds the Ehen, so all of the waters that drain from Crag Fell reach the sea at the same point). Crag Fell has no tarns. The pinnacles of Crag Fell are well worth a visit - they can easily be reached from Anglers Crag, and a good path runs into the middle of this unusual rock formation.